Quetzaltenango, also known by its indigenous name, Xelajú or Xela , is the second largest city of Guatemala. It is both the capital of Quetzaltenango Department and the municipal seat of Quetzaltenango municipality. The Municipality of Quetzaltenango consists of an area of 127 square kilometres (49 sq mi). Municipalities abutting the municipality of Quetzaltenango include: Salcajá, Cantel, Almolonga, Zunil, El Palmar, Concepción Chiquirichapa, San Mateo, La Esperanza, Olintepeque, and San Andrés Xecul. All these municipalities are part of the Department of Quetzaltenango, except San Andrés Xecul which is a part of the Department of Totonicapán. In Pre-Columbian times Quetzaltenango was a city of the Mam Maya people called Xelajú, although by the time of the Spanish Conquest it had become part of the Kiche Kingdom of Qumarkaj. The name may be derived from "Xe laju noj" meaning "under ten mountains". The city was said to have already been over 300 years old when the Spanish first arrived. With the help of his allies, Conquistador Pedro de Alvarado defeated and killed the Maya ruler Tecún Umán here. When Alvarado conquered the city for Spain in the 1520s, he called it by the Nahuatl name used by his Central Mexican Indian allies, "Quetzaltenango", generally considered to mean "the place of the quetzal bird" (although see note on etymology below). Quetzaltenango became the citys official name in colonial times. However, many people (especially, but not only, the indigenous population) continue to call the city "Xelajú" (pronounced shay-lah-WHO) or more commonly Xela for short, and some proudly, but unofficially, consider it the "capital of the Mayas". From 1838 to 1840 Quetzaltenango was capital of the state of Los Altos, one of the states or provinces of the Federal Republic of Central America. As the union broke up, the army of Guatemala under Rafael Carrera conquered Quetzaltenango making it again part of Guatemala. As of 1850, the city had a population of approximately 20,000. In the 19th century, coffee was introduced as a major crop in the area, as a result the economy of Xela prospered. Much fine Belle Époque architecture can still be found in the city. In the 1920s a young Gypsy woman named Vanushka Cardena Barajas died and was buried in the Xela city cemetery. An active legend has developed around her tomb that says those who bring flowers or write a request on her tomb will be reunited with their broken relationships. The Guatemalan songwriter Alvaro Aguilar wrote a song based on this legend. In 1930 the only electric railway in Guatemala, the Ferrocarril de los Altos, was inaugurated, which was later destroyed by mudslides and finally demolished in 1933. It had been built by AEG and Krupp and it consisted of 14 cars. The track connected Quetzaltenango with San Felipe Retalhuleu. The people of Quetzaltenango are still very proud of the railway. A railway museum has been established in the city centre. Since the late 90s Quetzaltenango has been having an economic boom, which makes it the second city in economy importance in Guatemala. With its first high-raise buildings being built, it is expected by 2015 to have a more prominent skyline, with buildings no higher than 15 floors. In 2008 the Central American Congress PARLACEN stated that every September 15, Quetzaltenango will be Central Americas capital of culture. 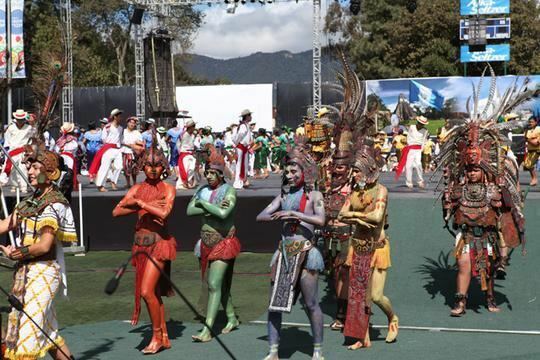 Quetzaltenango was supposed to host the 2018 Central American and Caribbean Games, but could not find the economic funding for the event. Quetzaltenango is known in Guatemala as "The City that is the Soul of Culture". The city has a lively music scene, and is home to numerous jazz and blues bands in addition to musicians playing in the native style. There is also a broader art scene focused on painting, singing and sculpture. Xela, the center of Quetzaltenango, is major tourist destination, and the city also attracts a large number of students seeking to learn Spanish. Historically, the city produced wheat, maize, fruits, and vegetables. It also had a healthy live stock industry. They exported throughout the country and with El Salvador. As of 1850, wheat was their largest export, followed by cacao, sugar, wool and cotton.